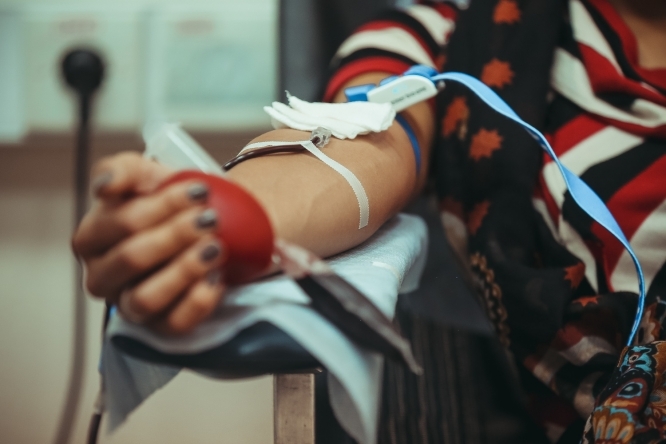 Half of all machines used to collect blood donations in France have been pulled from service amid fears that they could be dangerous for donors. Over 300 machines were suspended from use this week “as a precaution”, according to medical safety agency l'Agence Nationale de Sécurité du Médicament (ANSM). The machines in question are manufactured by American company Haemonetics. They perform a process called “apheresis” - a technique that takes blood from a donor, extracts plasma, and then re-injects the rest of the blood back into the donor. The ANSM recommended the machines be suspended from use after “several reports of [potential problems] with these blood sampling devices”. One such report came from Tarbes (Hautes-Pyrénées, Occitanie), the EFS said, in which “a number of black particles could be seen with the naked eye” inside the machine and the plasma collection bag. These particles were of “and unusual quantity and size”, according to the ANSM. A similar incident was reported this week. The ANSM also said that in 2018, there had been 49 reports “relating to noise [from the machines] during the collection process”. It added that there had been “recurring atypical incidents despite security measures already in place”. Concerns over the safety of the Haemonetics machines first started to emerge in May this year, when three whistleblowers made an official complaint about them to the French blood donation authority l'Établissement Français du Sang (EFS) and the ANSM, and brought a case against the agencies to the Paris regional courts. The whistleblowers claim that the machines could expose donors to potentially-carcinogenic elements due to the malfunctioning of the donation process. Donors could also see micro or nanoparticles of problematic materials - such as phenol-formaldehyde resin or aluminium trioxide - enter their bloodstream, they said. One whistleblower was Alexandre Berthelot, a former director of Haemonetics, who left the company in 2015. He has accused the company of bad practice. Another whistleblower, CGT union leader Guylain Cabantous of the EFS, hailed the suspension of the machines as a “huge victory”. But, he said that other machines by Haemonetics - such as those that collect platelets, and which he also suspects of being problematic - were still in use. In its defence, Haemonetics has said that it is taking the situation “seriously” and is “actively working” with the health authorities to “take appropriate action” if necessary. In France, there are still additional blood donation restrictions in place for anyone who lived in the UK from 1980 to 1996 - the height of the "mad cow" bovine spongiform encephalopathy (BSE) and Creutzfeldt-Jakob disease (CJD) epidemic. Anyone who lived in the UK during this time - regardless of their own nationality - is still not permitted to give blood in France.